I just made a charitable donation to a for-profit business. A cheese-maker, to be exact. This is not something one does every day, and not something I thought I ever would do. This calls for some rethinking about “profit” and food producers. My donation was for $50 on kickstarter, to Caromont Farm in rural Esmont, Virginia. I happen to know quite a bit about Caromont Farm because I am doing research on “New American Farmers” and that’s what they are. In fact they are one of the most interesting operations in what is something of a renaissance area for alternative food production. This is just over the Blue Ridge from Polyface farm, which has gotten famous due partly to “Pollanation”, but Polyface is only one of dozens of inventive operations in central Virginia that are redefining quality in food production. These operations vary in a lot of ways, but they share an ideological commitment to creating a sustainable alternative to our industrial food production system — and to staying afloat while doing so. One thing that keeps them up at night is the problem of growth – not growing plants and animals, but growing their businesses. How do we grow? How big do we grow? Should we grow? 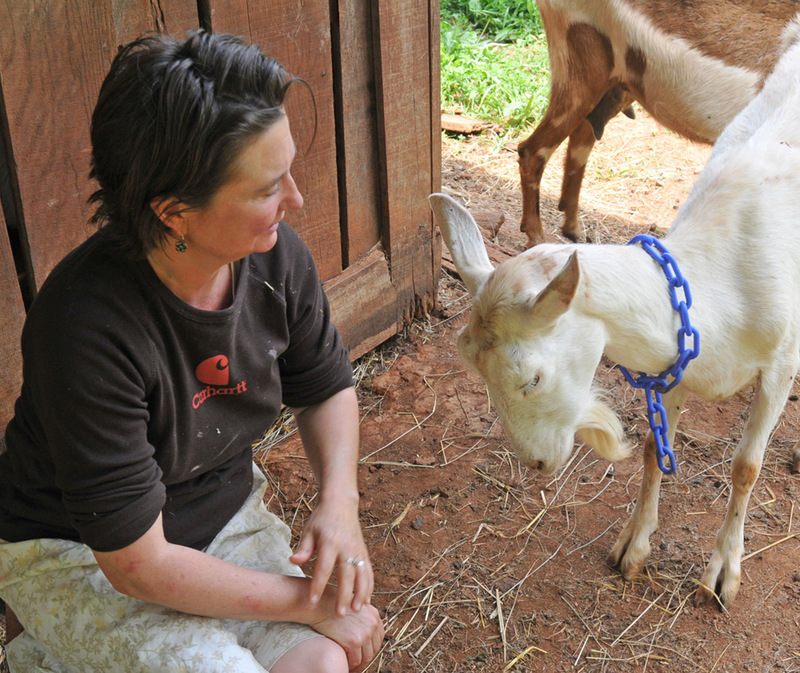 Caromont was started 6 years ago by Gail Hobbs-Page with 13 goats. She developed a roster of highly inventive, world-class cheeses. Powered by word of mouth, the operation began to grow: up to 50 goats of her own and regular purchases from other local producers (both goat and cow). Her cheese is now sold not only at farmers markets, but at several dozen restaurants, including Richmond, Atlanta, and DC, and now in Murray’s Cheese Shop in Greenwich Village. But although her cheese is popping up in distant places, this is a classic slow money operation, supporting two milk providers, two goat milk providers, several grass hay and alfalfa hay growers, giving free whey to local livestock farmers, and running a huge tab for feed and supplies with the locally-owned hardware store. Gail and Caromont have now reached a point where they do need to grow, specifically with a new cheese-making vat which costs (drum roll…) $35,000. For a small farm like this, which gets no government subsidy like big commodity producers, and which couldn’t get a bank loan if their life depended on it, it may as well be 35 million. Hence, kickstarter. But who would donate money to a for-profit business? Well, me, after some thought. We might start by reworking our concepts of for-profit and non-profit. Gail could be making more money as a chef, which is what she was doing at a high-end Charlottesville restaurant from 1994-2004. There she earned a reputation as a local food advocate before anyone had heard the word locavore. She could be making even more running a CSA program for Dave Matthews (whose farm is part of the local food renaissance), which is what she did before deciding to start Caromont Farm. Yes, Caromont is “for profit,” but they don’t make much profit, and it is clearly driven more by ideals about food production than profit. Meanwhile my employer, Washington University, is a “non-profit institution” but it’s also an enthusiastic player in the university-industrial complex and a leader in academic capitalism. But Washington University doesn’t pay taxes, and donations to it are deductible; Caromont pays taxes and donations to it are not deductible. Conclusion: just because the IRS divides businesses into profit and non-profit doesn’t mean I have to. But here’s the larger issue. Our corrupt, subsidized, cost-externalizing, environment-degrading, animal-torturing, overproducing agricultural system is never going to be fixed on capitol hill or in the statehouses. It simply has too much money and political power. The only way forward is a widespread, economically sustainable, alternative food system, centered on low-external input, ecological sustainablility, slow-money farms. Surprisingly, such a system is growing rapidly, and you support it every time you buy food from one of its producers. You can also support it by conventional charitable contributions; there are some non-profits out there doing good work to promote this sort of solution (Union of Concerned Scientists and Keep Antibiotics Working and two of my favorites). You can give them money any time and they will take it gladly (and pester you in perpetuity with requests for more). But this is different. This is a key area in the food & farming renaissance, this is one of its rising stars, and it is at a crossroads. So here I am, making a donation to a for-profit business, and feeling better about it than about most donations I have made to non-profits. Post script: they got more than they needed. Follow-up post here. This entry was posted in Food and tagged academic capitalism, agriculture animal traction technology, farming projects, goat cheese, kickstarter, virginia. Bookmark the permalink. We have a friend in cheeses. Wonderful Glenn, this is exactly what we also arrived at and and have been donating money to an organic farming cooperative in India since the last few years. The money is not tax deductible either for them or for us. However increasingly I believe that our ( my husband and I) contributions should go to these exceedingly brave, bordering on foolhardy, people working to save the planet for our children. When I seek funds for this cooperative , some friends who do not want to say no to me ask, are you involved with charities ? we could give money for the cause of orphan children or the aged… of course there are other friends , who simply on my behest have been regularly donating money to local food initiatives. Excellent use of 50 dollars in my opinion. If the farm had to take out a loan to buy that new cheese vat, they’d have to pass the cost along in the form of higher cheese prices — so you’re really purchasing future cheese at current prices! The tone of this article seems to treat the word profit as a dirty word; I’m not sure why. Because I made a charitable cash donation to them. I like my camera but I don’t make charitable donations to Nikon. Charitable donations virtually always go to… well, charities.